When Nick Kuyat was in kindergarten, his teacher asked the kids to cut a picture from a magazine of what they wanted to do when they grew up. While most of his peers were cutting out police and firefighters, Kuyat took it literally and clipped out an old man sitting in a rocking chair. 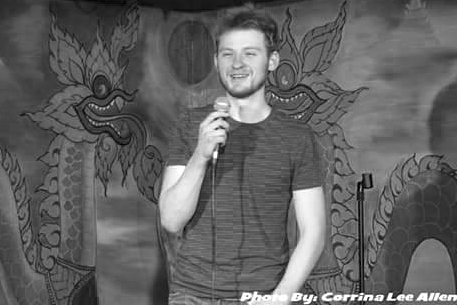 On a recent Sunday, Kuyat performed at Jai Thai, a restaurant in Seattle’s Capitol Hill neighborhood which regularly hosts open-mic comedy shows. “All pants are sweatpants when they’re nervous,” he said while standing under a pool of bright yellow light, wearing his finest dark blue shirt. Smiling, he held the mic stand with his left hand as his body gently swayed. “Franklin Delano Roosevelt was disabled AND president,” Kuyat said. “He must've had THE BEST parking spot!" Kuyat looked at the reaction of the audience, and it didn’t take them long to get the joke. The corner of Kuyat’s mouth curved up. And after all the laughter subsided, the only sound was the audience’s breath as they were all anxious to see what he would do next. Of all the comedians to perform that night, Kuyat received the most laughs from the audience. Kuyat specializes in doing one-liners, which are jokes delivered in one or two sentences. He likes turning life comedies into quick jokes, unlike many other comedians who can go on for five minutes about a single event. “Which is kind of funny, because I am weird and tall,” he said with a laugh. Kuyat believes keeping the jokes short and weird can be a lot more challenging than telling longer stories. You would think comedians would be happy, optimistic people since they seem to constantly make fun of life and themselves. However, Kuyat explains that the opposite is often true - he got into comedy because of the social difficulties he faced as a teenager. “I would say I had a rough time at school and sadly, (unhappy experiences are) where comedies come from,” Kuyat said. Kuyat considers himself an old soul and he felt that made him a bit out of tune with his classmates. However, when comedy came into his life, he became more confident and found a way to socialize with people his age. “Yeah! Right? ” Kuyat said. The Chinese student later introduced himself and offered him a handshake. Without hesitation, Kuyat took the handshake and introduced himself right away. After Kuyat got off the bus, he kept smiling. “Huh, making new friends on the bus, that’s interesting,” he said with a laugh. Comedy has become a major part of Kuyat’s life and he now pays extra attention to everything around him, such as advertisements or life events, in search of things to make fun of. However, he doesn’t see himself pursuing stand-up comedy for a living. Kuyat is also seriously considering being a lawyer. “I’m taking my first law class next quarter. Which is actually funny, because I’m Jewish, and I do comedy, and I’m interested in politics and law, so apparently I am all about bringing stereotypes to life,” he said. Still, he doesn’t think he will ever stop writing.